Message Stick Audio Conferencing is an instant conferencing service that simply requires access to a phone to enable highly productive meetings with participants from anywhere around the world. Use high-quality, on-demand audio services to communicate and interact with people all across the globe in real time. No reservations, operators or time limits. Receive permanent dial-in information for all of your calls. Invite participants from all over the world with access numbers in over 100 countries. Control your conference commands from your telephone keypad. 24/7 Client Support always available when you need it. Message Stick Audio Conferencing builds on clarity of sound with capabilities that help the conversation flow more like it does in face-to-face meetings. The result is an enhanced speaking and listening experience that encourages better participation and exchange of ideas. As an organiser, you receive personalised credentials – a dedicated phone number, leader code and specific conference code – for initiating and managing conference calls. You can set up conference calls quickly and easily to collaborate for weekly status calls, regular sales updates or any other business purpose. Organise audio conferencing sessions 24/7/365 for participants working anywhere in the world through desktop phones, mobile devices or VoIP connections. Receive push notifications when someone first enters your waiting room and again after five minutes of inactivity as a reminder to start your meeting. Use Voice over IP to talk and control your meetings with carriers that do not support simultaneous voice and data or when traveling internationally to avoid high roaming charges. Add a new level of engagement between yourself, participants and their peers with the in-meeting chat feature. Increase meeting security by setting a required application password for all accounts within your organisation that can be set to expire periodically. See when you have a free moment and the ability to schedule a meeting by using the in-app calendar using your device’s native calendar. 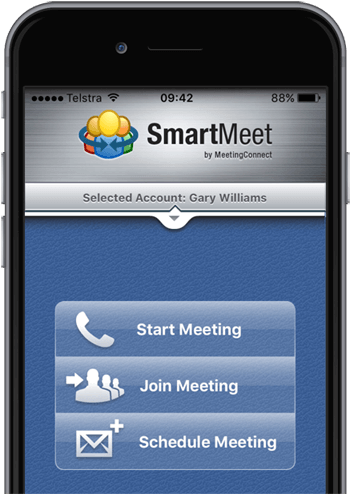 View participants in your meeting or waiting for your approval to join your meeting by easily navigating between the Participant and Waiting Room view tabs. Maintain total meeting control with in-app features—mute, unmute, rename, disconnect all or individual participants and much more. Directly from your conference, you are able to dial-out to domestic participants and bring them into your call or you can contact the operator to dial-out to international participants. Decide how your participants are announced when they join or leave the conference call. Choose from the following options: tone, name announce, name and tone, or silence. Silence all participants’ lines by pressing a keypad command on your telephone. Group mute/unmute helps reduce background noise and limits interruptions during your conference. Expand your global reach with international conferencing solutions. We offer five methods to connect your international participants to your conference call, including links through our international call centers, toll and toll-free access numbers, a dial-out option, or a permanent dial-in number. Mute your participants lines, allowing you to deliver your message uninterrupted. Lock your conference call to prevent additional participants from joining the call, with the exception of dialing out. Looking for which telephone numbers to provide your international participants? Immediately, there is no need to activate it. Once you receive your ‘Welcome Email’, you are ready to go. Simply tell your participants what time the meeting will start and give them the dial-in telephone number and the participant passcode. What do I need in order to join a meeting? All you need is a telephone, the dial-in number and passcode. What meeting telephone number did the person dial? What was the telephone number the person dialed from? What was the type of telephone used (e.g., mobile, landline, or IP phone)? How do I alter the announcement when someone joins a call? Audio Conferencing settings can be changed during the call or via the Help desk. Options for both entry and exit of participant, include: no announcement, a tone, a generic announcement Someone has joined the call, or a personal announcement that gives the participant’s name. To change during the call, the Chairperson presses *3 on their telephone to cycle through options. What is an Audio Conferencing dial-in number? A an Audio Conferencing dial-in number allows local and international participants to dial into the conference calls using a local dial-in number. Where can I find a list of MeetMe Audio Conferencing dial-in numbers? To view your complete list of Global Access Numbers, visit the Find Your Global Access Numbers page on our website. In which countries is Audio Conferencing available? Audio Conferencing is available from over 55 countries. To view your complete list of Global Access Numbers, visit the Find Your Global Access Numbers on our website. *6 Mute on/off – If you are in a noisy environment or on a mobile phone, you can mute your own line. Participants can mute their own line when not speaking. This will reduce background noise levels in the conference call. Try not to use the speaker phone on your mobile phone. If unavoidable, use the mute function stated above when not speaking and move away any projectors from the microphones. *0 Operator assistance – Use this function if you still find you have sound problems and a Conference Coordinator will help you to resolve any audio problems. An international dial-in number allows participants from over 55 countries to join the call with a local dial-in number, saving them the cost of an international call. What is Audio Conferencing Recording? Audio Conferencing Recording allows you to instantly record your Audio Conferencing calls by pressing *2 on your telephone keypad. Once the call is completed the chairperson can download the recording for archiving or to share the recording for future use. Can I record my Audio Conferencing conference calls? Yes – now, it’s easier than ever for a Chairperson to record an Audio Conferencing audio conferences. Just press *2 and your recording will begin, press *2 again if you wish to stop the recording. When your meeting ends, the chairperson receives an email notifying them of the recording’s location. Is there an additional cost to record a Audio Conferencing conference call? Yes, there is. Please refer to your service terms and conditions. How can I access the Audio Conferencing Recording after my conference call? When your meeting ends, the chairperson will receive an email with a web link to a website where you will be able to retrieve your recording. Click on the web link and follow the instructions. Your recording is password protected and will require your unique password to access your conference recording. You have the option to archive or share the recording by saving the recording directly onto your computer, posting it on a website or forwarding it on to your contacts via an email.